Major Motion Picture, On Ice. 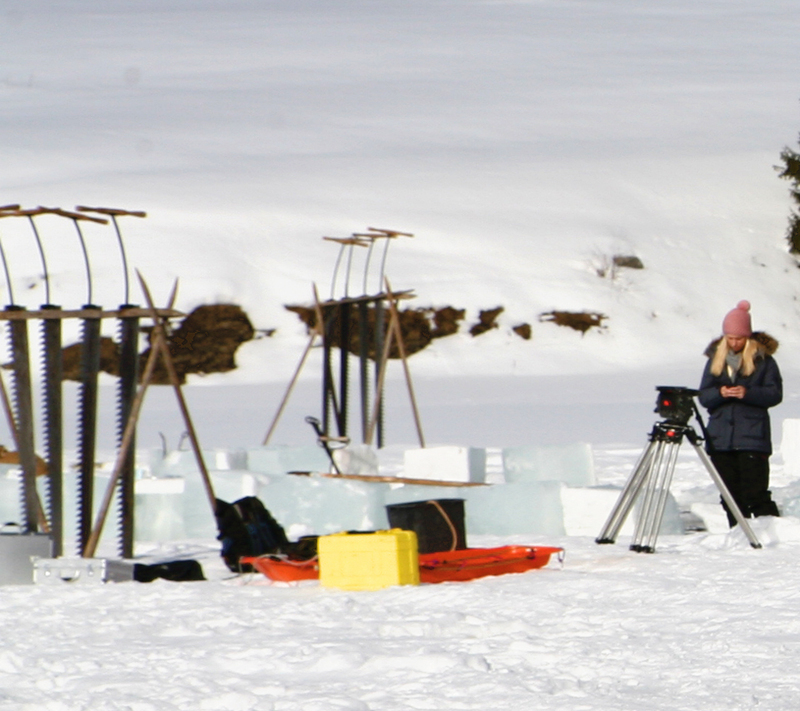 On Monday and Tuesday immediately following the ice-cutting festival, a film crew set up in the same spot on the lake. I counted about forty people, from which I inferred that it’s either a major motion picture starring – I don’t know – Colin Firth, say… or it’s a commercial for something cold and “fresh”. I suspect it’s the latter. I had thought I heard a chain saw, and this does look kind of look like one. In fact it’s some kind of snow-mobile. They’re actually illegal here, the lake is a “nature area”. I quite like it, though. That’s not a snow-mobile. That’s a a murder-robot with chainsaw feet. Oh, there’s the FoodPress logo again. I hate couscous and sautéed asparagus. If that is a snowmobile, it looks like it has its innards hanging out. Now I see FoodPress, which I had not seen before. What is going on? Trond, do you hate couscous, or sautéed asparagus, or both? Or just the two in combination? I habitually dislike snowmobiles, but I enjoyed seeing that scary red-and-black thing. I do like the saws. After checking “snowmobile” on Wiki, I know why that strange object does not look like one: it does not have skis in front like Canadian snowmobiles. Catannea has a nice header for her new blog, you can see a fraction of it on the right hand side, here. 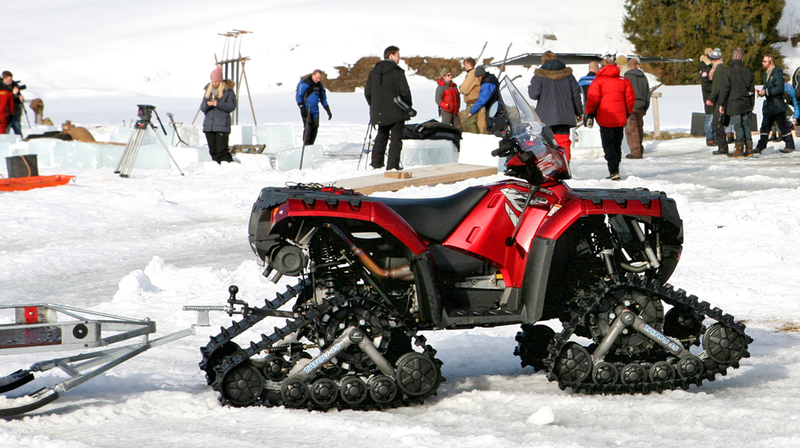 Thank you for identifying the problem with the snowmobilelike machine, m-l. I knew there was something wrong with it. It must be a 4WD snowmobile. You and Ø seem much more used to snowmobiles than I am – we never see them, although I know the Sami use them, to get around and to herd reindeer, up north. Trond, in principle asparagus with couscous sounds really good. I might even make it (I’m trying desperately to not use meat in our meals). I wouldn’t dream of buying it readymade, though. That would be disappointing. It’s odd that Catannea doesn’t see the advertisements. I’m not sure it’s that pure. Small children and geese float around in it during the summer. How can you screen grab it to show the ads if you don’t see them? Or maybe I’ve misunderstood. Ø: I have nothing against either couscous or asparagus, alone or together. I had something against WordPress adding intrusive ads. Anyway, about snowmobiles (and sorry if I’ve told it before): Years ago, fresh from engineering school and in dire need of a job, I found myself being temporarily employed as a teacher in a small valley town in rural Norway for a month, teaching maths to eighth and ninthgraders. Or that’s what I thought — when I came there they had moved some faces around and I was in charge of teaching Norwegian and social subjects to third and fifth and Gym to the boys in the final year. I knew this was my only chance, and luckily I had used a chainsaw, so I managed to give the impression that I knew how to handle it. I added that it was a Husquarna. I think that’s what saved me, since his father sold them, and they were the best, much better than those Japanese ones! I later told the story to one of my old cabin companions, and he could inform me that the saw was a Yamaha. I don’t know much about snowmobiles. I tend to view them as a pestilence: a noisy intrusion on the peace of the great outdoors and a lazy alternative to getting some good exercise. On the other hand, or perhaps the same hand, I find them somewhat fascinating. And the unusual-looking red one on the lake is very cute. I used to live in Northern British Columbia (Canada, next to the tip of Alaska) and many people there had snowmobiles for roaming the forest on weekends or explore unplowed roads. Not so much the native people though: they had cars which they used on the main road. I thought we were supposed to call them “snow machines” now. Or am I stuck in 2008? The exact name probably varies between one country and another. In Canada I think that “snow machine” would be interpreted as “snowblower” (a machine for removing snow by blowing it off rather than shoveling it) rather than “snowmobile”. Or perhaps even a snow-making machine (used on ski slopes when there is not enough natural snow). I forgot to ask, where was that? I only meant, a series of screen-grabs to show the ad-free Bad Guide. I cannot imagine what these ads look like, nor where and how they appear. And one reason I am semi trying to start a WordPress blog is that I like the pure, clean appearance of this one. Yes – I’m with m-l; a “snow machine” to me is a machine that manufactures imitation snow for skiing in conditions of insufficient precipitation. Gee. I got all polysyllabic there. I’ll go stick my head in a bucket. Although, you know who has a much cleaner layout than mine is Tom Clark and Julia, which are the other kind (I’ve forgotten what it’s called. Blogspot? Blogger’s Paradise?). But I use it because is the one I learnt to use guided by Tamás. I was not a thoughtful choose, just necessity. I think you can have good results with one or the other, catannea, so please show us the wonderful work you and your husband do wherever you want! What’s inside a beaver tail? Is it sweet or savory? It’s just fried sweet dough, in shape and size roughly like a beaver’s tail. A high-calorie snack, perfect to eat while skating but also available in many other places where people are not necessarily involved in energetic activities. I have never skated on the Rideau Canal, but I have been in Ottawa in the winter and in the morning people dressed for business, carrying attaché cases, were skating to work. When I was a teenager we spent a family vacation on the Rideau Waterway. We rented a houseboat and lived on it for a few weeks, tying up now here, now there. I believe I later learned that my father’s father’s father’s father’s father’s father (not sure if I got the number right there) who migrated from Fife in Scotland to Canada was one of the engineers involved in building the canal. Some people sell a similar snack as “bear paws”. Those names attract children and tourists. Ø, do you live in Canada then? No. Some intermediate generation settled in the Chicago area, and I’ve lived most of my life in the northeastern US. My family used to head northward every August, sometimes as far as parts of Ontario. Sometime this involved the kind of camping where you drive into the park and pitch a tent. Sometimes it involved some canoeing. I believe that the houseboat version originated when an ad in the NYT Sunday magazine caught my father’s eye. I’m pretty sure the film recorded on AJP’s lake was Kon-Tiki, about Thor Heyerdahl and his balsa fleet expedition. My wife saw the film last week and showed me the making-of tonight. Oh, how exciting! Thanks for telling us. We’ll have to see it. I just hope you won’t find it too disturbing with all those tropical scenes taking place on ice. When you make film in Norway you have to shoot when the crew is booked. I admit, I was wondering… If we’d known, we would have served them Margaritas.